Protesting members of the Super Falcons have returned to their Agura Hotel, Abuja base after the Presidency promised that the money owed them by the Nigeria Football Federation would be paid on Friday. 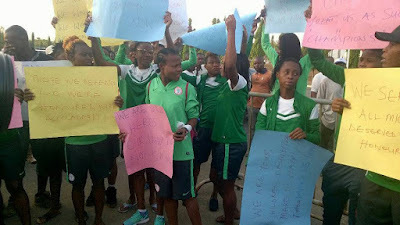 Members of the female football national team had on Wednesday morning stormed the National Assembly protesting the non-payment of their allowances by the NFF. The team won the 10th African Women Cup of Nations, beating hosts Cameroon 1-0 in an explosive final in Yaounde. It was a record eighth title for the Nigerian ladies but the victory instead of putting smiles on the faces of the players, pitted them against the football body over the payment of their allowances and bonuses. Reports say each player is entitled to about $25,000. The girls, however, returned to their hotel after the Chief of Staff to President Buhari, Abba Kyari, addressed them and promised to offset their bills in two days. The players, who carried placards, were hoping that President Muhammadu Buhari, who was due to visit the National Assembly today to present the estimates of the 2017 budget to lawmakers, would see them and put an end to their plight. The treatment meted out to the record Aftican champions by the Nigerian authorities is in sharp contrast to that received by runners-up Indomitable Lionesses from the Cameroonian government. The social media has been awash with pictures, videos and stories of the lavish ceremony put in place by President Paul Biya to honour the Cameroonian ladies despite finishing as runners-up on home soil.